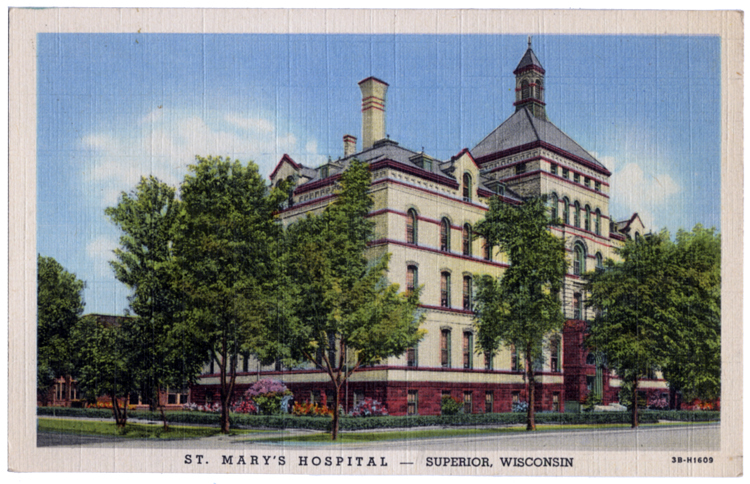 During the early months of 1893, three nuns serving with the Poor Handmaids of Jesus Christ arrived in West Superior with instructions to open a hospital. In August of the following year, the order opened St. Mary’s Hospital along Clough Avenue, to be operated by the nuns and lay people. Seven years later the sisters added an annex to the rear of the building to house themselves, which freed the hospital’s third and fourth floors, their former residence, for hospital use, increasing bed capacity from fifty to two hundred. In 1920 the hospital opened a training school for nurses, and in 1929 a facility for student housing was built. In 1969 St. Mary’s merged with St. Joseph’s to become Holy Family Hospital. The building was used for administrative staff and nuns’ quarters until it closed in 1975; it was torn down in 1979, a year after St. Mary’s Nursing Home was built in Billings Park.